The web interface distributes all the functions over the Monitoring , Inventory , Reports , Configuration , and Administration tabs. 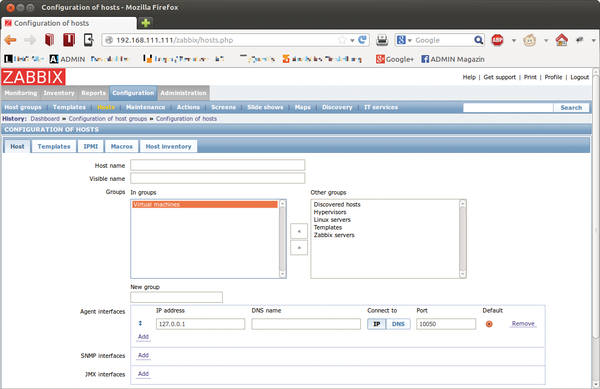 The Configuration | Hosts menu is used to monitor a host with Zabbix. The host list in the appliance also includes the Zabbix server itself, which can also be monitored with Zabbix. For a new host, select all in the Group menu and then press Create Host ; this takes you to the dialog where you can configure the host. The host does not need to be a PC. A host in Zabbix-speak is any network device that has an IP address. Along with a freely selectable Host name and a slightly more detailed Visible name for the monitored host, where appropriate, you also need to select a suitable host group. The preconfigured groups are merely provided as examples. Next, provide the obligatory technical parameters, such as the DNS name, the IP address, and the desired port (by default, this is the Zabbix port number 10050) for monitoring (see Figure 2). Figure 2: Configuring the monitored hosts in the web interface. After you've created an initial host for monitoring, Zabbix can now collect data from it. To allow this to happen, go to Configuration | Hosts and, in the Items column of the host list, click on the matching Items(0) link. Then, use Create item at the top right to open the Item dialog to configure the monitor type. The available monitoring types are found in the Type drop-down box. Besides the default entry, Zabbix agent , the options include various SNMP agents, an IPMI agent, an SSH agent, a database monitor, simple checks, or external checks. In addition to the monitor type, you can press the Select button beside the Key box to select from a number of internal Zabbix keys that more closely specify the details of the monitoring type. As a fast agentless test, you could, for example, set the Simple checks type and then select the icmpping Zabbix key in the Key field. You can click Select to view a list of all keys for the Simple checks type. To configure this simple type of monitoring using ping, press Save ; it now appears in the item list with a status of Enabled, although initially no trigger is configured. You can then move on to configuring the triggers. Again, in the Configuration | Hosts menu, go to the Triggers column and click on the link. To create a new trigger, you then select Create trigger . The dialog initially wants you to enter an intuitive name. Pressing the Add button then lets you formulate the associated Expression , which describes when the trigger assumes the true or false state. After clicking Select , you first select the item from the Items list in a pop-up window. The entry for Function is set by default to Load (most recent) T value=N , which you can use without any changes. This means that the trigger assumes a true state if the last computed value of the xxxxx:icmpping item is N (null) . Clicking on Insert defines the expression and sends you back to the Trigger dialog, in which you can then define the Severity of the trigger using the list box. This can be, for example, Information or Warning . The Expression constructor link lets you define individual triggers and add macros, if needed. Pressing Save takes you back to the trigger list, which lists the newly defined trigger in the Status column with a status of Enabled . You can view trigger status at any time below Monitoring | Triggers . You need to set the right filters to find the trigger in question in the Host or Group fields (Figure 3). Figure 3: Zabbix shows the status for each trigger in the Monitoring menu.